Squared Faro #366 was first produced by Russell & Morgan Co. in 1887 to supply gambling casinos. The cards have square corners and are one of two known USPC decks made without indices. 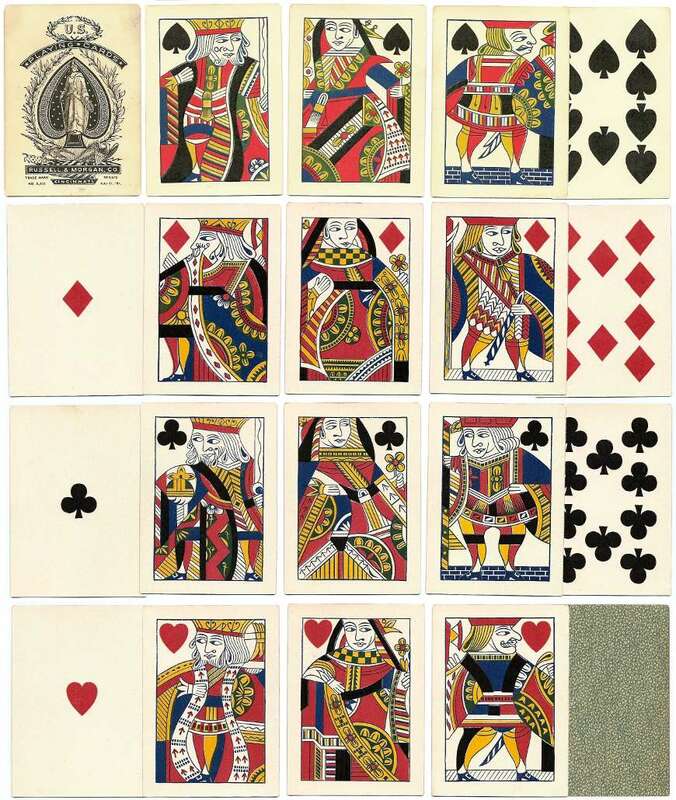 The court cards are full-length figures which contain many of the idiosyncratic features associated with designs re-copied from the woodblock era. The numeral cards are double-ended. The brand was still sold until 1900. The Russell & Morgan Co. 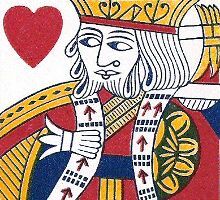 Ace of Spades was used throughout the entire life of the brand. Above: Squared Faro #366 playing cards published by Russell & Morgan Co. c.1887. The court cards are full-length, but the numeral cards are double-ended. There is enough margin around the court cards to allow for trimming several times during the cards' lifetime. Images by kind permission of Mike Jacobs. From the beginning the company used the most modern equipment. A card-punching machine enabled cards to be punched quickly and accurately from the printed sheets, which gave greater precision than the manual method of cutting and trimming cards used prior to that time. See also: U.S.A. • Bicycle No.808 • Bicycle Seconds • Congress No.606 • Jumbo Bridge No.88 • Historic Boston • Vanity Fair.